It was a ordinary day in my life - up until approx. 3 o'clock in the afternoon. Then the phone rang and my phone logger had a breakdown with all the figures it had to write. 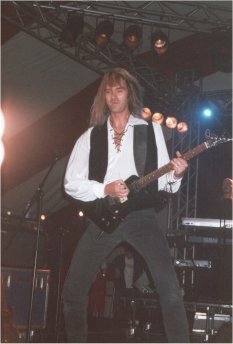 The phone call was from Holland and the very nice voice in the other end belonged to the charizmatic multi instrimentalist Arjen Anthony Lucassen best known for his rock operas in the band Ayreon - but he started his musical career in Dutch melodic rock bands Bodine and Vengeance. We started out with small talk concerning the present political situation in The Netherlands. 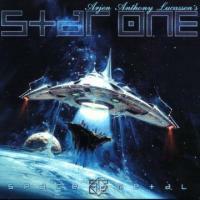 And after having discussed the late Pym Fortuyn - the lack of respect for human life and democratic life style I was ready to pass a few questions to Arjen concerning his newest and highly praised project Star One and the album "Space Metal"! - featuring a lot of prominent guests (again) like: Jens Johansson, Erik Norlander, Russell Allen, Damien Wilson and Robert Soeterboek. 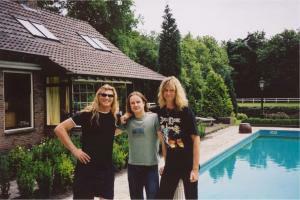 Q: How would you describe the difference between you former projects in Ayreon wich also was an all-star-concept-band-thing with Mr. Lucassen in the middle and your present project Star One? 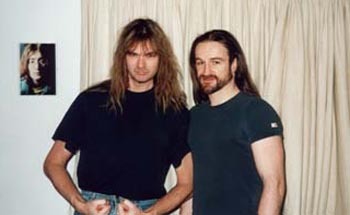 A: Well, like Ayreon this project is "Arjen with a few friends" but this time I deliberately worked towards a more band feeling, I also wanted more of a Live-feeling in the album - like the old Boston albums with the stamp "No computers used in the making of this album". In fact the whole album was meant to be a simple in-your-face album - but it turned BIG along the work proces. I think the producer in me took over, heh heh! Q: But the audience have responded very good to the album - the critics have all been very positive (myself included) - did that surprise you? A: Yes, it totally blew me away. Star One in the beginning was a side project - a cult album in the making. But for the first time I entered the Duthch and the German music charts immediately - that surprised me! But what also surprised me was that I was the main attraction in the project. In some way I thought the past fuzz on the Ayreon albums was because of the many guests I had brought in - but this time, the album was my me in the lead role! Q: What gives me a very special feeling with the Star One project is the attitude of a complete package. The music, the musicians and the art work is very tasty - how do you work with that? And are you a escapism freak with the hang to science fiction - all song are inspired of a film concerning life in space? A: I am very concerned about the whole presentation of an album. Like you said - it is a complete package. The art work is almost as important as the music and the over all attitude - all things have to fit each other! I think nowadays you have to give the audience value for the money - mainly because of the possibilities on the Internet. I think that the real fans of me and the Science Fiction genre will be able to recognize each and every one of the tracks! Q: On the Special Edition of the "Space Metal" album there is a Hawkwind medley - sung by Dave Brock himself. How on earthe did you manage to get him in the studio - he has never made an guest appearence all his life? A: I have been a Hawkwind fan all my music carreer (even in Vengance) - I think since the start 70's. Dave Brock is about 60 years old now, and I have tried to make a contact with him through a Dutch guy who is resposible for the live sound for Hawkind on tour. I finally got a line through to Mr. Brock and he invited me to England, where he lives on a castle - and he is a real English Gentleman - and I had the week end of my life with him - recording the whole thing. And got to talk a lot with him! Q: Besides this Gentleman of rock you have all kind of talented guys around you on the album - I recently heard Robert Soeterboek in Wicked Sensation But you have an interesting way of using the different voices to different kind of moods - how do do that? Damien Wilson is very powerful - like a young edition of Ronnie James Dio! A: Robert sing on most of my demoes - and sometimes he does it that well, that it is the final recording. But this time Robert made the background vocals only. 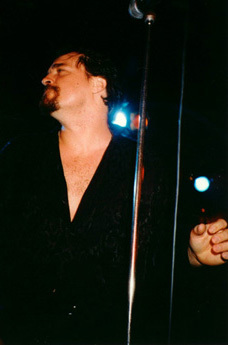 Damien Wilson is very special to me - he sounds like Robert Plant, but doesn't like him so that gives him a very special vocal range and so has Russel Allen from Symphony X. Ronnie James Dio is one of my favorite singers of all time - even if he deals with sword and magic genre it is escapism, too I think! I have not planned taking this album to the scenes. I actually made a small tour with Lana Lane in New York, Los Angeles and Tokyo earlier on. But all musicians are very busy at the moment so a tour is NOT planned. The next project will be an Ayreon album - with a more progressive attitude - less metal but including new efects like DVD and other multi media features- it will be expensive - so it will have to wait until the money has been raised! Q: That was nice talking to you - I hope that you will have all the luck in the future that you deserve. This Star One "Space Metal" will be one of my favorites for 2002!